ATTRIBUTES: Tourmalinated Quartz has the combined properties and unique energy vibrations of both Clear Quartz and Black Tourmaline. Clear Quartz amplifies vibratory energies and intentions. Black Tourmaline’s cleansing and grounding influence keeps the Quartz Crystal clear of any negativity. The Quartz Crystal amplifies the Black Tourmaline’s cleansing energies. The combination of the Clear Quartz and Black Tourmaline makes this crystal a powerful energetic tool to clear out “bad vibes” while repairing the auric field. An effective grounding stone, the long “threads” of Black Tourmaline strengthens the body’s energy field against external invasion and creates an energetic shield against detrimental environmental influences. Tourmalinated Quartz cleanses the aura, clearing energy patterns that have resulted in stagnation. Tourmalinated Quartz helps to integrate and heal the shadow energies. Tourmalinated Quartz helps to release the outworn patterns and reestablishes energetic flow with emotional clarity. Tourmalinated Quartz helps one feel both enlightened and grounded. Tourmalinated Quartz offers purification, protection and stimulation to the energetic bodies. Tourmalinated Quartz helps one to understand and appropriately deal with hostile situations and relationships. 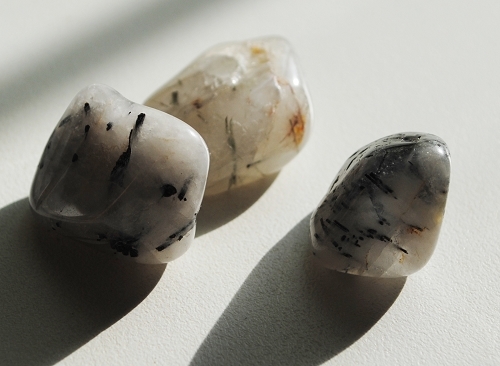 Tourmalinated Quartz aids in the elimination of destructive and outworn behavioral patterns. Tourmalinated Quartz facilitates clear thinking. Tourmalinated Quartz is helpful to those people who need help staying on the spiritual path. HEALING: Black Tourmaline strengthens the immune system, treats dyslexia and arthritis, provides pain relief and helps to realign the spinal column. Quartz Crystal is a master healer and may be used for any condition. Quartz Crystal stimulates the immune system and brings the body into balance. Tourmalinated Quartz has been used in the treatment of disorders of spinal alignment, circulatory disorders, ameliorate toxicity, and strengthens the structure of the veins. Wearing or carrying Tourmalinated Quartz creates a “bubble” of light protection around the body. This crystal is a great tool for psychic protection, as Tourmalinated Quartz filters out negative energies while enhancing overall awareness. Tourmalinated Quartz facilitates out-of-body experiences and provides protection while traveling. Tourmalinated Quartz is an excellent crystal for healing rooms and environments. Tourmalinated Quartz absorbs energies released during sessions, purifies the energies and recycles them back into the field. Tourmalinated Quartz may be used as an aid for those who are trying to detox and purify their bodies after substance abuse or for those who are trying to improve their diet. In crystal body layouts or healing grids, Tourmalinated Quartz harmonizes the meridians and the subtle bodies restoring dynamic balance to all the chakras and creating a general sense of well-being. Tourmalinated Quartz facilitates the access and integration of the full spectrum of electromagnetic energy. The Full Spectrum energy vibrations ensure healing and balance throughout the physical body and auric fields. Tourmalinated Quartz assists one with clarity and purification on physical, emotional and spiritual levels allowing for further processing and growth. The energy of Tourmalinated Quartz combines well with Moldavite, Charoite, Sugilite, Black Obsidian, Jet, and Citrine.